DWP - ✔ - Drain plug to remove condensation water to maintain IP 44. It gives a controlled change in pressure. In the enclosures pressure differentials can occur during extreme temperature variations, when this happens there is risk of dust and humidity inside the enclosure. Mounting with a PG29 thread with nut, recommended torque of 5 Nm (max. 10 Nm). For optimal pressure compensation we recommend to use two devices on opposite sides towards the top of the enclosure. Sealing gasket NBR. Weather proof and UV light resistant according to UL746(f1). Air interface of approximately of 1.5 cm². Plastic according to UL94 V-0. Sealing gasket NBR. Round hole 37 mm diameter. Plastic pressure compensation plug with waterproof membrane. In certain locations there can be wide temperature variations especially over a short period of time, which creates pressure differences from inside to outside of the enclosure. The pressure plug equalises the pressure inside and outside the enclosure allowing air and humidity to leave, while only allowing dry air to enter inside the enclosure. 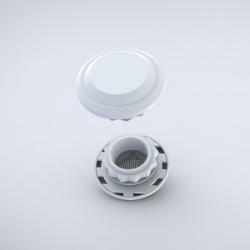 The plug can be easily installed and only requires a round hole to be machined. The pressure compensation plug reduces the risk of dust entering the enclosure, ensuring that a vacuum is not created. Built up humidity can leave the enclosure which reduces potential hazards with electrical components. The ease of installation reduces the labour time required and means that the modification can be done on site while the enclosure is operational, saving unnecessary downtime. Highly recommended to install two plugs per enclosure for optimal pressure compensation. The plugs should be both be installed at the top of the enclosure but on opposite sides. If a higher protection degree is required, then the compensation pressure plug, EDA/EDAS, should be installed.